Skiing in Nevada? Who knew? Actually, below Atlantic City. I mean, I spotted... unsavory items in the parking lot! Plus some drunk getting cuffed and arrested when I made my Starbucks run at 9a.m. Maybe you were in a bad part of town Erika? The website showed me all the lovely places to visit. Hehehehehe. 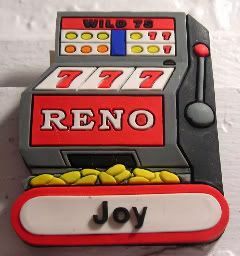 I liked Reno. It's half-small city, half-old school Las Vegas. However, avoid the Circus-Circus Casino. Those scary clowns are everywhere.